Scotland's "The Motor World" car magazine. Homepage. This page: A look at a post-war issue of The Motor World, a journal for motoring enthusiasts north of t' border. The Motor World - "Scotland's Only Motor Journal". The Motor World was a weekly motoring magazine aimed at motoring enthusiasts in Scotland. The full title was The Motor World and Industrial Vehicle Review, incorporating the Motor Cyclist and Scottish Cyclist. It was edited by a Geo. H. Cutbush, and this October 8th 1948 issue was issue 2276, Volume XLV (or 45), suggesting that the title had run from the earliest days of motoring. 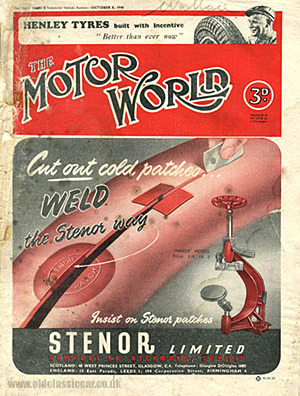 The cover features a couple of advertisements, one for Henley Tyres, and a larger plug for Stenor welded inner tube repair patches. The company's 'Major' puncture repair machine costing 18 Pounds 8s 0d also gets a mention, although I think it would only be garage owners that would be buying a piece of equipment such as that. Turning the page, carefully as this issue isn't in the best of condition, there are adverts for Dunlop (The World's Master Tyre), Oddie nuts, the in-car Philco radio (at 27 Pounds 2s 11d), Lodge spark plugs, Weathershields sliding car roofs, and the new Standard 12cwt Pickup Utility and Delivery Van. The latter was based on the Vanguard saloon, and was due to go on show at the International Commercial Motor Transport Exhibition at Earl's Court, on October 1st - 9th 1948. Within the Editorial section are some thoughts on compulsory inspection of motor vehicles, or what would much later become the 10 Year (MOT) Test. Subtitled "A Steamhammer For a Nut", the author isn't wholly keen on the idea, suggesting that accidents caused by defective vehicles were in the minority, when compared to other contributory factors, citing issues with road planning as being a much greater cause of fender-benders. The lack of information regarding who would foot the bill for a network of testing stations, and staff to work in them, was also something that the author wasn't too happy about. Other industry news & correspondence for October 1948. News this week in history included Jaguar announcing the prices for it's new Mark V models, although it was largely academic as for the time being, all production was destined for export anyway. Once they were available to domestic buyers, prices would be 988 Pounds plus 275 3s 1d Purchase Tax for the 3.5 litre saloon and coupe, and 930 Pounds plus 259 Pounds 1s 8d for the 2.5 saloon and coupe. Talks had also just been completed for a new motor vehicle proving ground to be located near Nuneaton, on what was previously Lindley airfield. The site would be available to all businesses who were members of the Motor Industry Research Association, or MIRA as it is still known today. Nuffield also announced that commercial vehicle shipments by Nuffield Exports Limited would, in 1948, be four times higher than those ten years earlier, and MG announced a new 1.25 litre tourer to join their TC model. "In the years preceding the war accessibility was a matter of supreme importance, but today this feature appears to be only of secondary interest. While alligator bonnets, rear hinged, may make certain engine details more easily inspected, the streamlining of the modern cars creates many problems for the owner who likes to do his own servicing. In several cases, of course, no starting handle is provided, while the fashionable "spats" for rear wheels will complicate tyre changing on the road. Again, unless hydraulics are fitted, the jacking of certain models will be an arduous and dirty operation. Inbuilt headlamps, too, have their drawbacks, while spring loaded windows will be satisfactory until one day they stick in the open position and I suppose their correction will necessitate the removal of the door trimmings. Streamlining has drawbacks as well as advantages, especially if carried to the extravagant stage." My guess is that in part he is referring to models such as the Austin 10 that featured an alligator bonnet, replacing the conventional centrally-hinged version found on pre-war Tens. A half page feature takes a look at the Wolseley Oxford, a British taxi-cab that had been introduced shortly after the war, in 1946. It met with instant approval from both drivers and passengers alike, thanks to its ease of maintenance and interior comfort. The taxi was built at Wolseley Motors' Birmingham factory. 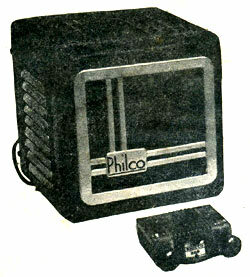 In 1948 a buyer could, for the first time, opt for a fully-enclosed cab, an improvement that had been requested since the launch of the original version. The standard Oxford taxicab cost 780GBP plus purchase tax of 217GBP 8s 4d, and the version with a partition alongside the driver cost an additional 15 Pounds plus p.t. Several pages of The Motor World were given over to motorsport news, starting with a look back at the 1948 British Grand Prix at Silverstone, a race won by Luigi Villoresi from Ascari, both in 1.5 Litre Maseratis. As the magazine was written with Scottish readers in mind, a number of sporting events from that region received some coverage, including the MG Car Club (Scottish Section) sporting rally. Although organised by the MGCC, several other marques feature in the entry list - these include HRG, Singer, BMW, Ford, Watson and Healey. A photo of the Healey, during a wheel changing test and belonging to R.T. Haddow, is shown, as is T.H. Legget's Singer Le Mans in the same test. Further on in the magazine is another article, one of a series by "Calculus" on how to build a "Five Hundred" (ie 500cc) special/racer. After the sporting section there is a small piece about Ford cars, and the many books that have been written about them. One new title, by Edgar Duffield, was titled "Ford Through European Eyeglasses (1907-1947)". Seventeen years of his working life were spent at Ford, some of which was spent as editor of the Ford Times factory magazine. An interesting nugget of information about Fords is also revealed - it turns out that Mr Duffield was the man responsible for Ford model names that would become etched into the minds of classic Ford enthusiasts - namely Anglia, Prefect and Thames. The final pages of this publication are given over to trade advertisements for cars, car accessories, motor dealers and servicing emporiums. Perhaps someone remembers buying a new Rootes-group vehicle from James Ross & Sons of Edinburgh, or maybe a Jowett Bradford or Javelin from the Eastern Motor Company Ltd, of George Street also in Edinburgh? Those with deeper pockets might have opted to visit John Croall and Sons Ltd, as they were distributors for Rolls-Royce and Bentley motorcars. Loyal buyers of Rover cars could well have frequented James Gibbon Motors Ltd of West Nile Street in Glasgow, and those to whom Singer cars appealed, would no doubt have been familiar with Taggarts (Glasgow) Ltd. 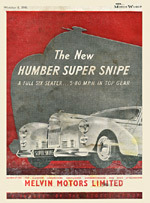 Inside the rear cover is a two-colour full page advertisement for Melvin Motors Limited, a distributor for the New Humber Super Snipe - "a full six seater ... 5 - 80mph in top gear". Talking of Top Gear, there was another Scottish magazine around at the time, published by the Scottish Sporting Car Club and titled Top Gear. A copy of this mag dating to 1951 features on this page of oldclassiccar, again within the motoring magazines section.